In a way, it’s a pity I’m married because if not, I’d be getting my World of Warcraft subscription right now to test this theory – do gamers really get the girls? (or the boys, let’s not be sexist). Is romance really likely to blossom while you are ruthlessly destroying your enemies with a rocket launcher? Our infographic today comes courtesy of OnlineUniversity.net and shows that there is indeed serious groundbreaking world-changing research going on out there. White jacketed doctors walking around with clipboards prodding gamers and asking them about their love lives. I wonder if the research was sponsored by the company that brings you World of Warcraft? The same way that you hear about all those surveys about how the new Internet Explorer is the safest browser out there, compared to the upstart Firefox and impertinent Chrome, and the study turns out to be sponsored by Microsoft! So what do you think? Are you a gamer who found true and everlasting love online? Tell us how it happened and how it ended up. 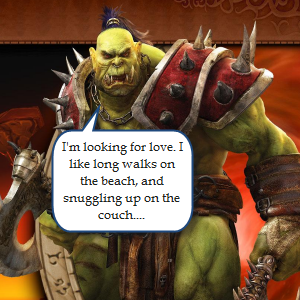 If you are single, maybe you should give up on the singles websites and sign up for World of Warcraft instead? Here’s the link as a public service to you. Let us know how you get on finding your soulmate. Explore more about: Infographic, Multiplayer Games, Online Games, World of Warcraft. It's really a cool and useful piece of info. I am glad that you just shared this useful information with us. Please stay us up to date like this. Thank you for sharing. As a female, I can say that gaming has a lot more attractions than online dating. For one, online dating is slow, when compared with gaming, there's not nearly as much interaction between couples (you have to fill out lengthy questionnaires, and then sit and wait while maybe one person is matched with you). In gaming, there's a lot more communication between people, which can lead to further interactions outside of the game. I'm currently in a relationship with someone that has the same love for gaming as I do, and though I didn't meet him through a game, I have met various other males who have shown interest in dating female gamers. Also, I have made multiple lasting friendships through games that I wouldn't have acquired otherwise. "do gamers really get the girls?"